Displaying absolute class and sophistication, Giorgio Armani never fail to present us with luxurious offerings. In the 2015 launched the campaign, “ Frames of Life.” Inventing fictional characters where the frame matches the personality and lifestyle of each featuring an interactive website. 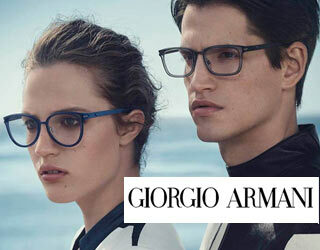 With both statement frames and simplistic looks, Giorgio Armani suit any style. Making a statement with its attention to detail and the use of premium materials, Giorgio Armani achieves the same recognition as the clothing line. Giorgio Armani is a limited distribution collection. Fashion has proudly been selected to be an authorized dealer since 2000.